In de documentaire Race to Save the Reef duikt CNN’s Ivan Watson naar de zeebodem om de schadelijke invloed van de klimaatveranderingen op Australië’s Great Barrier Reef nader te onderzoeken- schade die volgens experts kan leiden tot massale uitsterving. CNN ontmoet Charlie Veron, ‘s werelds meest bekende expert op het gebied van koraalriffen, die 45 jaar van zijn duikersleven heeft doorgebracht in de Great Barrier Reef en persoonlijk 20% van ‘s werelds koraalsoorten heeft ontdekt. Beschreven door Sir David Attenborough als een moderne Charles Darwin, waarschuwt Veron de wereld al decennialang voor de teloorgang van het rif, waar record temperaturen in slechts 2 jaar tijd meer dan de helft van het koraal in het rif gebleekt en gedood hebben. Watson reist naar het Australian Institute of Marine Science, waar wetenschappers experimenteren met nieuwe technologieën om het rif te beschermen. Dit varieert van robots tot zonneschermen maar behelst ook onderzoek naar het kweken van temperatuur-resistent koraal dat kan leven in de oceaan. In a dusty, secluded corner of the Australian state of Queensland, a septuagenarian scientist is on an urgent mission to raise the alarm about the future of the planet. John “Charlie” Veron — widely known as “The Godfather of Coral” — is a renowned reef expert who has personally discovered nearly a quarter of the world’s coral species and has spent the past 45 years diving Australia’s Great Barrier Reef. One of the natural wonders of the world, the Great Barrier Reef is 2,300km long — roughly the length of Italy — and is the only living organism that can be seen from space. “I was a climate change skeptic, at first,” he says. He realized that climate change was “serious” in the mid-1980s, and around 1990 he became “alarmed” about its impact on coral reefs. Veron says the mass bleaching events in the past few years — and the prospect of losing one of nature’s greatest treasures — were a wake-up call for the world in the wider battle against climate change. “It’s more than an alarm bell,” says Veron. “It’s an air raid siren.” But the die-off came as no surprise to him. Back in the 1990s, he had predicted that climate change would destroy the reef, documented in several books he published, and in a 2009 keynote lecture titled “Is the Great Barrier Reef on Death Row?” at the Royal Society in London, where he was introduced by veteran British naturalist Sir David Attenborough. 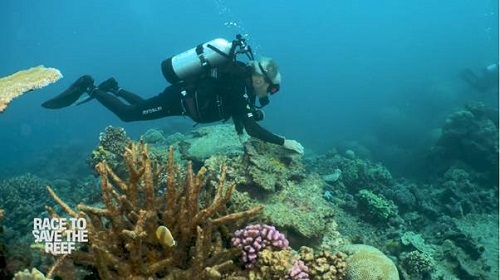 Attenborough described Veron as “one of the great authorities in the world on coral” who has “devoted himself to looking after and raising awareness about the dangers facing the reef.” Among the Australian conservation community, Veron’s reputation is also unmatched. After the recent mass bleaching events, Veron dived in multiple areas of the Great Barrier Reef to see the damage for himself. “I was seeing it and feeling it and it was absolutely horrific, there’s no other way to describe it,” he says. In the summer of 2018, experts say no bleaching occurred, which has helped some of the bleached coral to begin the recovery process. But Veron says it takes about 10 years for corals to recover fully, and they simply don’t have that sort of time. We must act to save the Great Barrier Reef, which is a sign of all the oceans’ health. If the GBR dies, the oceans die, and soon after, humanity will die amidst catastrophes we can’t even begin to predict.